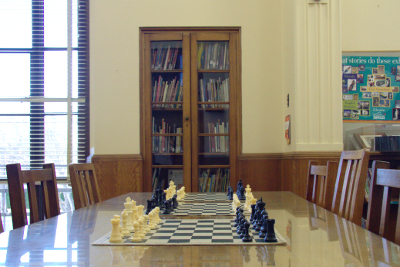 Chess has been taught at Ainslie School for over 22 years and is led by our renowned Chess Coach Mr Keith Robertson, a retired Air Force Officer, educator and a local resident. Chess is an excellent way to develop critical thinking skills such as problem solving, decision making and lateral thinking. Keith has a great passion for the game of Chess, and the contribution that he believes the game can make to the lives of young people, saw him receive an ACT Children's Week Award in 2008. Keith has been a volunteer chess coach at Ainslie School for over 16 years. He has extended this commitment into High School, as his students move through the years. Keith is totally inclusive in and offers enrichment and challenge to our students regardless of ability. He shares his weekly publication, 'Strategies of the Week' plus the current chess 'ladder' and the next game of play, with the staff and students in preparation for every Friday as a 'chess day' at our school. Keith models exemplary interactions and player behaviour, creating a culture of mutual respect and appropriate behaviour for young people through the game of chess. He encourages both boys and girls to enter chess and organises tournaments to provide confidence in participating. Staff, students and their families respect and admire Mr Robertson. All are in awe of his commitment, dedication, expertise, patience and perseverance.